Tonto Creek is a year round stream with a considerable water flow that has formed a deep, remote and often narrow canyon below the Mogollon Rim in central Arizona, one of dozens of similar ravines like West Clear Creek and Oak Creek near Sedona. For 30 miles it snakes through the steep hilly land at the north edge of the Tonto National Forest, starting right beneath the Rim at an elevation of 6,600 feet. Here the rocks are sedimentary, the surroundings densely wooded and the canyon quite shallow but the character soon changes as the creek flows south into a particularly rugged area known as the Hellsgate Wilderness. 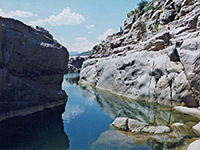 The rocks become jagged and metamorphic with a great variety of colors and forms, and enclose a canyon that is over 1,000 feet deep in places and contains many beautiful pools, cascades and flooded narrow channels. When the hills eventually recede and the creek enters a wide valley near the little town of Gisela, the land is now part of the Sonoran Desert and has typical Arizona scenery of huge saguaro and other cacti. This marks the end of the canyon - Tonto Creek continues south through much flatter countryside and 20 miles downstream enters the upper end of Theodore Roosevelt Lake. A trip through the whole canyon is quite a major undertaking as this takes at least 2 days and involves a lot of swimming and climbing, but several sections are suitable for shorter visits. The very upper end of the stream is a pleasant area with a few easy woodland trails and is good for wildlife viewing. 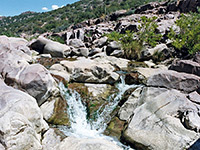 Part is set aside as the Tonto Creek Recreation Area, a non-fee site that also has facilities for picnics, fishing and camping. It is 16 miles east of Payson, reached by a spur road north of AZ 260. The creek flows under AZ 260 a few miles south of here and is next accessible by the unpaved Bear Flat Road, which crosses the stream at another good fishing spot. After this there is only one more entry point before the canyon enters the rough, roadless expanse of the Hellsgate Wilderness - this is TR 37, a 7 mile jeep/foot route (the Hellsgate Trail) which follows a ridge then drops 1,500 feet from the pine woods to the bottom of Tonto Creek gorge near the junction with Haigler Creek, a big tributary that upstream has created its own deep ravine. This is the start point for the two day backpacking hike through the main canyon, a strenuous trip of about 17 miles. 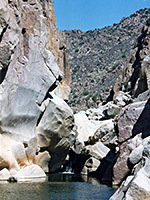 The southern end of the main canyon is close to a paved road and so is more suitable for a short day hike; the area is reached by road FR 417 which leaves the main highway US 87 at Rye, at the end of its big descent from fir forests into desert country, and meets the creek near Gisela. 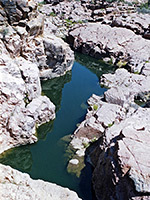 There is a popular swimming hole a little way into the canyon, and even a short hike a couple of miles further into the gorge is rewarded by fantastic scenery of deep pools and clear water cascades, framed by beautiful cliffs of pink and white granite. Recent reports (2009) suggest that the local landowner has closed access to the creek at this point, however. The nearest towns with hotels close to Tonto Creek are Heber and Payson.